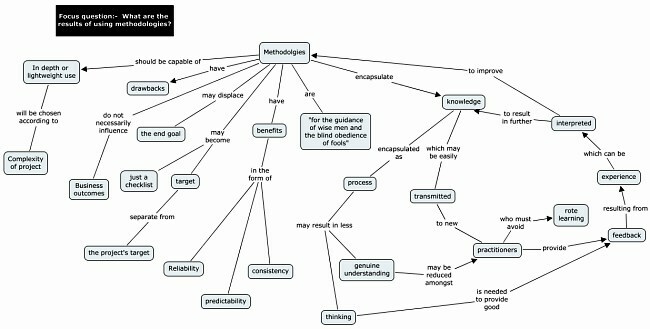 CMAP is software that I often recommend to anyone asking about concept maps, and a tool I use myself from time to time. It is platform independent and network enabled, so supports collaboration on intranets or servers throughout the Internet. I keep trying to download cmap to my MacBook Air (v.11) with OS X 10.8.2 and when I try to open the installer icon after the download, it tells me the file is damaged and should be moved to the trash. Any tips? I’ve tried right mouse clicking by the way…..
OS X 10.8.2 is Mountain Lion, isn’t it? I’m loving the simplicity of Cmap tools, however I really need an equivalent that I can use online – as I need to access from multiple locations on multiple PC’s, and I dont always have ability to install software. Anyone know of Cmap-like SaaS/online product? Closest functionally I’ve found is bubbl.us, but it is too visually crowded for large complex maps. Yes, bubbl.us would be the the first browser-based one to occur to me, as well. Just to break your question down, there are two problems: 1. Access from multiple PCs; and 2. editing without the right to install the software. 1. Did you know that there are public servers for Cmap, where Cmaps can be held on-line and edited from anywhere with an Internet connection? A map can even be edited by more than one person simultaneously and the Cmap server provides help when edits conflict. There is a directory of Cmap servers though some may be behind firewalls. If you open a map you wish to place online and then select Save Cmap As it will show Location: My Cmaps. Click the globe on the far right of that line, and you’ll see several IHMC servers. Pick one of the public ones (I suggest number 3) and you’ll be able to save there. Then you will be able to open the map from any computer with Internet access. You can even make your own folder to save the map in, though you will have to dig to find out how you do that. You can protect the folder for your maps. There is an article about controlling permissions, here. 2. Now for installing the software: There is a portable version of Cmap that can run from a USB without installation. You could give that a try. Naturally if the PCs are locked down so you don’t even have USB access, that won’t be a solution. Going back to browser-based concept mappers, you could consider Webspiration. Apart from that, bubbl.us is the only proper concept mapper (anything-connectable-to-anything / linking phrases) I know of. There are plenty of on-line mind mappers, but if you’re using Cmap, they probably won’t meet your needs. Do let us know what you decide on eventually, and if you find out how to make a folder on a Cmap server, please add a comment here.